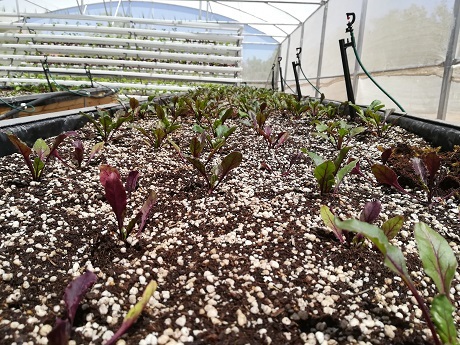 Up amid the skyline of Johannesburg, entrepreneurs, chosen by business incubator WIBC and supported by the Johannesburg Inner City Partnership, are growing salad and vegetables commercially. 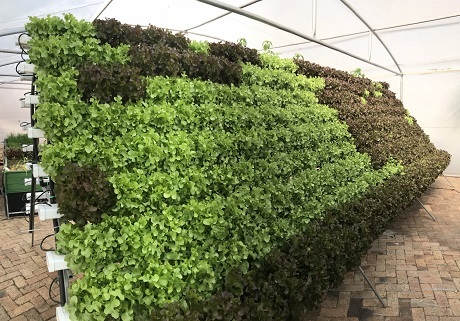 Future Farms, a company designing and installing dual hydroponic commercial systems of containers and tunnels, was contracted to build the rooftop gardens. Everything in these eleven rooftop gardens (so far, but more are in the works) has been done with a tight budget in mind: no automatic ventilation or fertigation, just extra steel in the frame to cope with wind sheer up above the city. 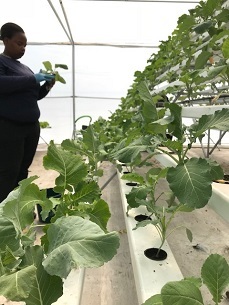 Due to the LED lighting panel redesigned by Future Farms to bring down costs, as well as the recirculation of water in a hydroponic system, the electricity and water bill for each rooftop garden comes to far below R1,000 (65 euros) a month. (It doesn’t use solar energy; solar panels would push up costs considerably.) Future Farms have developed their own range of LED grow lights. 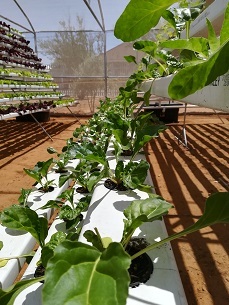 The basis of the farms is an A-frame holding 600 plants, grown with nutrient film technique (NFT). It was estimated that each rooftop gardens needs six such frames to produce a minimum of 3,600 plants during each month-long cycle. The A-frames are supplemented by beds filled with a medium of coconut husk, perlite, vermiculite and probiotic for crops that need to be planted in greater density, like baby spinach, rocket or parsley. The salad, herbs and edible flowers produced by the rooftop farmers, most of whom had no previous farming experience before the hydroponic and business training they have received, are currently sent to a supermarket chain as part of a six month-trial. He takes FreshPlaza to the rooftop garden of one of their best farmers next to the Fox Street Market, previously a semi-industrial area. She has just gone through her fourth harvest cycle and has proven herself committed to rigorously follow the specifications of the supermarket and her mentors at Future Farms. Jeremy grew up on a mixed farm in KwaZulu-Natal where he saw firsthand how hail can take out an entire vegetable crop (“Everything’s trying to hurt you when you’re planting in an open field,” he notes). After studying civil engineering he spent five years building an indoor 500m2 vegetable farm, teaching himself the hard way how hydroponics works. At the beginning of last year he joined forces with lighting company Halon Energy to form Future Farms. They work primarily on large-scale commercial hydroponic farms, based on their dual system approach using both containers and tunnels, done on a cost basis appropriate for the developing world and beyond. In the containers every aspect of the growing cycle is controlled, allowing a growth cycle from seed to a 250g head of lettuce within 28 days. Before the end of the year they’ll unveil a dual system farm (thirty tunnels and six containers) in Touws River, Western Cape, a complement to the A-frame hydroponic garden they’ve already set up at a neighbouring school (pictured right). The community will be the largest shareholder in the farm, run by local entrepreneurs who have cut their teeth at the school farm, supplying produce to a large retailer. Also on the cards is one of the largest indoor container farm in South Africa, planned to be constructed in the Johannesburg CBD, as a baseline farm to generate passive income for Future Farms and ensure constant supply for retailers, into which the rooftop farms plug.